18ct Yellow Gold Cartier Style Diamond Set Bangle — Form Bespoke Jewellers Ltd.
A stunning designer led diamond bangle, inspired by Cartier. It is always nice when a customer comes to us with ideas inspired by a designer he/she likes. In this case, they came to us for the design and creation of a Cartier style diamond set bangle. This 18ct yellow gold bangle is channel set with a row of small round brilliant cut diamonds around each edge. 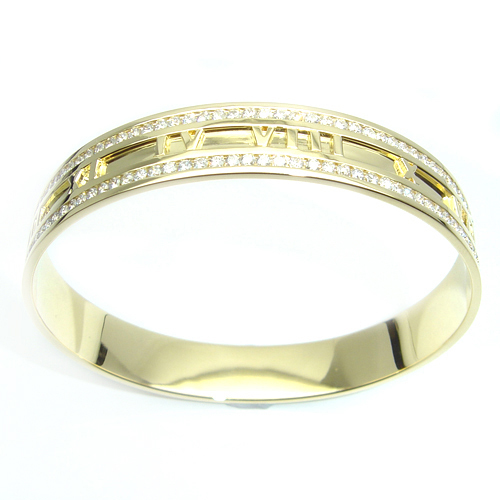 Then in the centre of the band are Roman numerals which are a styling choice inspired by Cartier.